According to the event promo, VIP tables, which include prime seating for eight guests and a celebrity, along with VIP room access, cost $1,000. Tables are also available for $500, which includes seating for eight along with an ORU baseball student-athlete. Proceeds benefit the ORU baseball program. Individual seats are also available at a price of $50 each. To reserve a table, contact Debbie Gimlin at (918) 495-6424 or dgimlin@oru.edu. 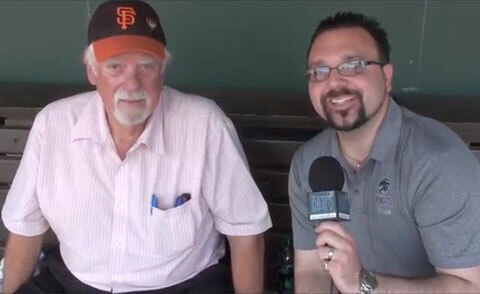 Watch the video where MLB Hall-of-Famer Gaylord Perry made a special appearance at Knights Stadium on Friday, June 14, 2013 to meet and greet fans. Perry signed autographs and threw out a ceremonial first pitch. He also talked to Tommy Viola of Knights TV. Perry is a retired MLB right-handed pitcher. He pitched from 1962-1983 for eight different teams in his career. During a 22-year baseball career, Perry compiled 314 wins, 3,534 strikeouts, and a 3.11 earned run average. He was elected to the Baseball HOF in 1991. Playing Field Promotions is a booking agent for motivational sports speakers and celebrities. If you would like to book sports speakers or pro athletes like Gaylord Perry for a speaking engagement, guest appearance, charity fundraiser, product endorsement or corporate event, contact our booking agent for appearance and speaker fees or call 1.800.996.1380.